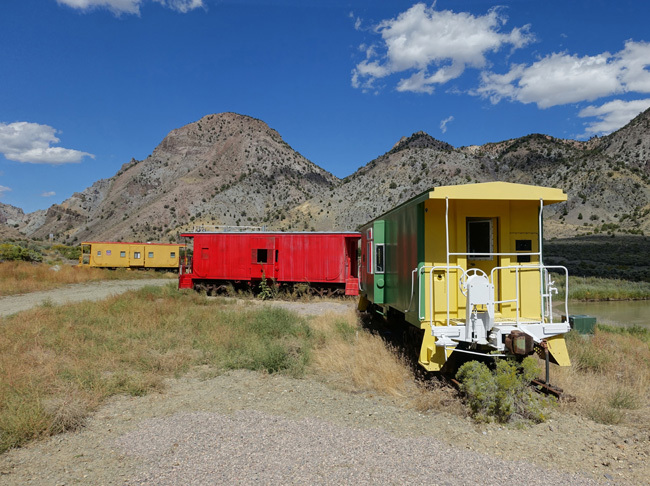 A train graveyard lies along the bank of the Sevier River at the base of Utah's Big Rock Candy Mountain. I have only one complaint about Utah: There is so much breathtaking scenery that it's impossible to drive anywhere without having to pull over every few minutes to admire the view. 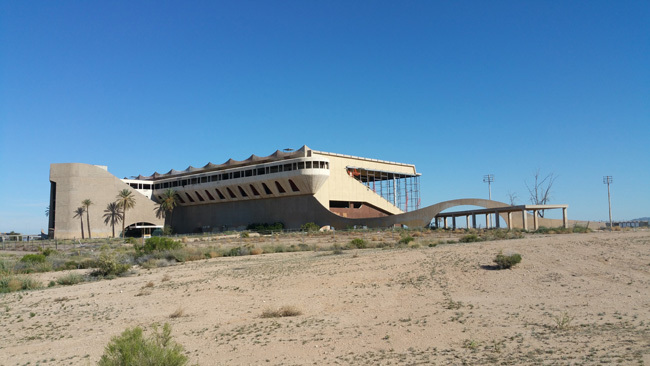 My original plan was to head directly from the ruins of Osiris Creamery to the abandoned military base in Green River. Little did I know, I'd be drawn in by fascinating abandoned potato cellars in Antimony, old shuttered businesses in Circleville, and vacant homes in Junction. 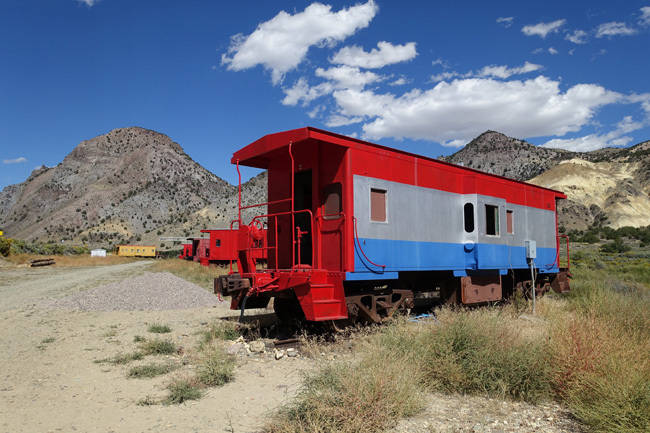 As I made my way back toward the freeway, I was hooked by another unusual sight that I couldn't resist pulling over to investigate: a railroad graveyard on the bank of Sevier River. 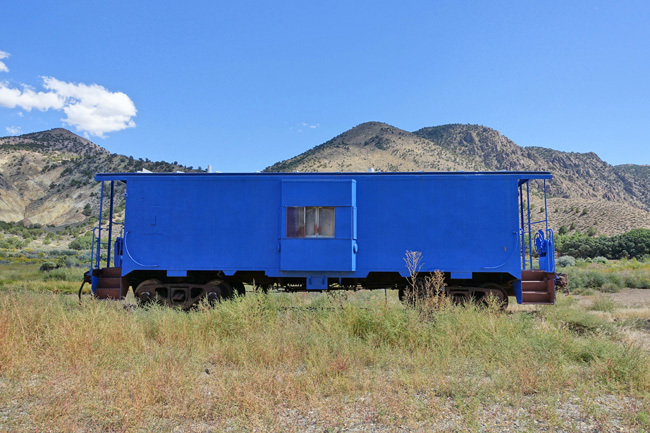 A dozen brightly painted train cars sat in an otherwise vacant lot beside the Sevier River while clouds drifted lazily above, casting patches of shade on the mountains. It was so gorgeous, I felt like I had wandered into a Claritin commercial. 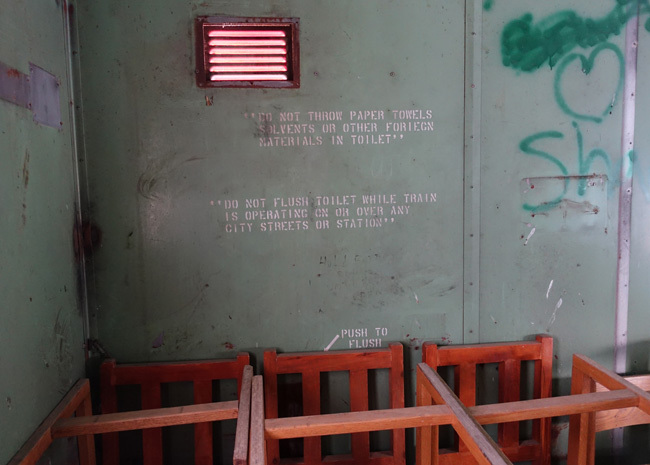 There were no signs to indicate why the train cars were there, but they were too freshly painted to be abandoned. 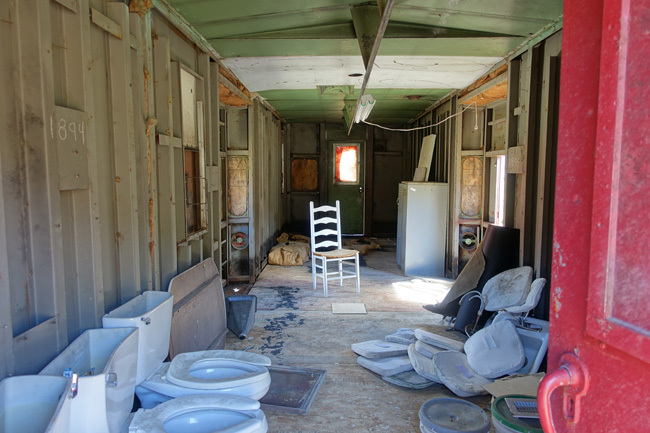 The caboose had a little patio with a lawn chair and curtains in the window, so I kept a respectful distance in case someone was staying there. 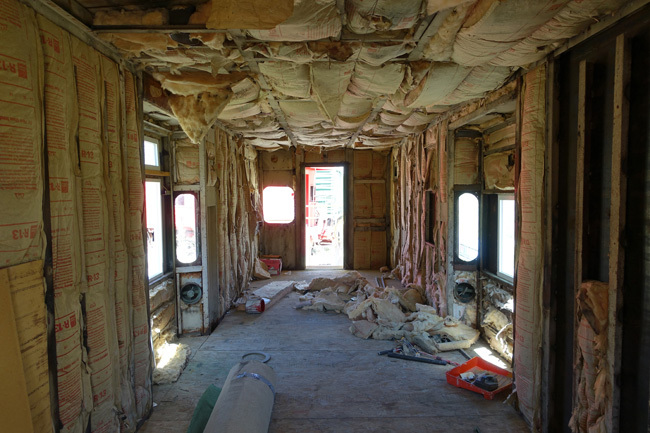 The other train cars were open and didn't appear inhabited, so I took a quick look inside. Some were being used for storage. 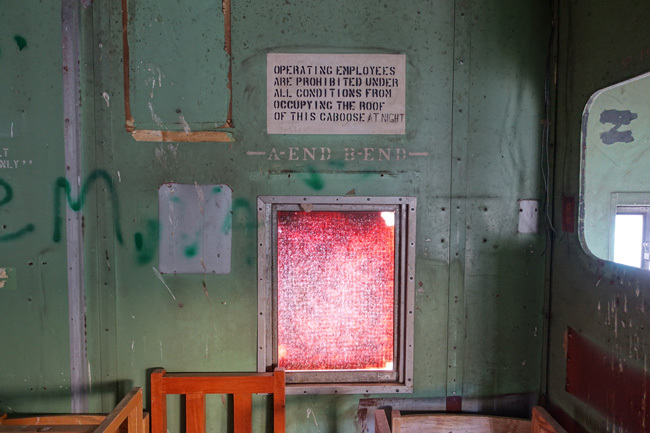 A few had instructions stenciled on the walls, which reminded me of the stencils I had seen on the walls of the abandoned Titan Missile Silo launch complex and other military bases I've explored. The warning in the below picture made me smile. And so did the spelling error. I'd never heard of fusees before I saw this. 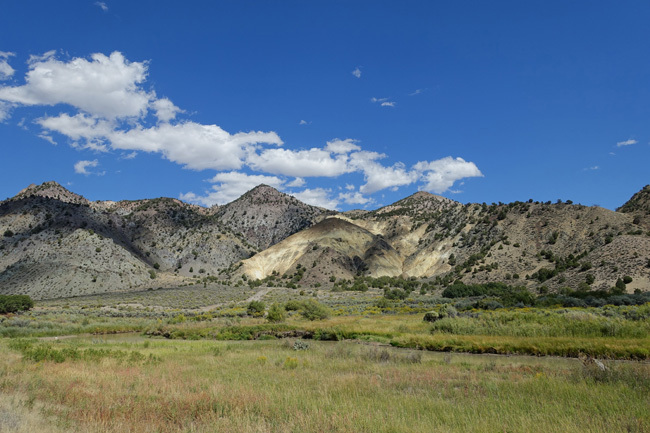 Big Rock Candy Mountain was named after a folk song written by Harry McClintock in 1928 (You can listen to here). It describes a hobo's idea of paradise, with free lunches, cigarette trees, a lake of gin, and where people are tender-hearted and the concept of work is shunned. 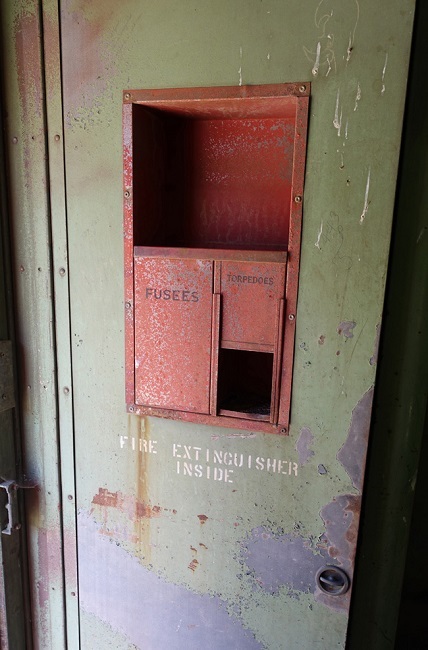 The song also says "The boxcars all are empty and the sun shines every day," which seemed perfectly appropriate. In recent years, "Big Rock Candy Mountain" has been remade as a children's song, with the cigarettes and alcohol edited out. The actual mountain does look a bit like nougat with caramel ribbons running through it. Candy Mountain is also referenced in a bizarre viral video with a surprisingly dark twist ending (you can watch it here). 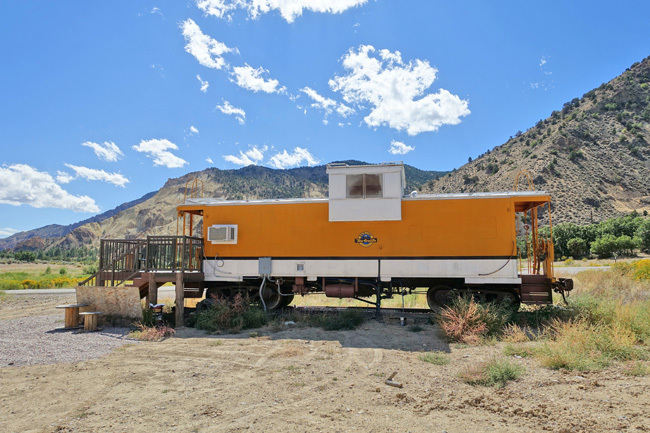 The Denver and Rio Grande Western Railroad's Marysvale Line once passed along the eastern bank of the Sevier River, but was retired in 1976. 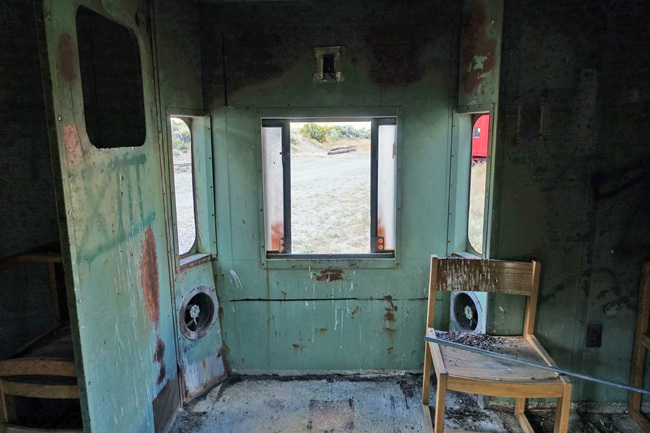 After floods destroyed the rail line in 1983, the county transformed it into a 14-mile hiking and bike path called Candy Mountain Express. 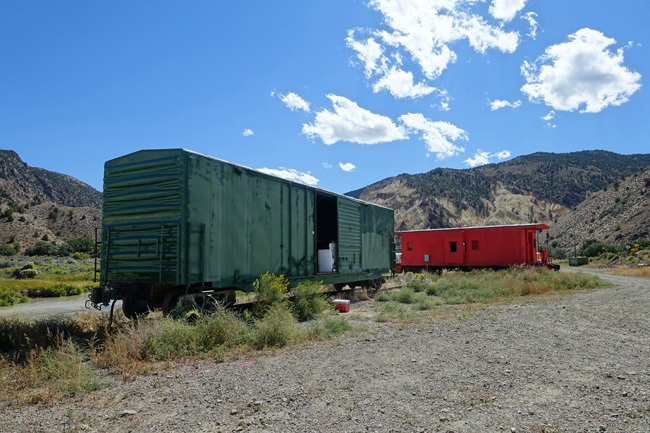 I did a bit of research and found that the train cars were in the midst of being refurbished and turned into a group of lodging units called Caboose Village, part of the larger Candy Mountain Resort. 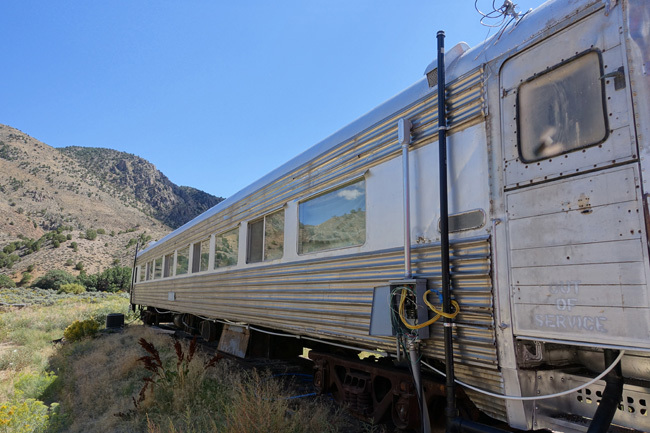 They offer accommodations for 2 up to 10 people in each train car, and all provide air conditioning, bathrooms, flat screen TVs, coffee pots, and microwaves. 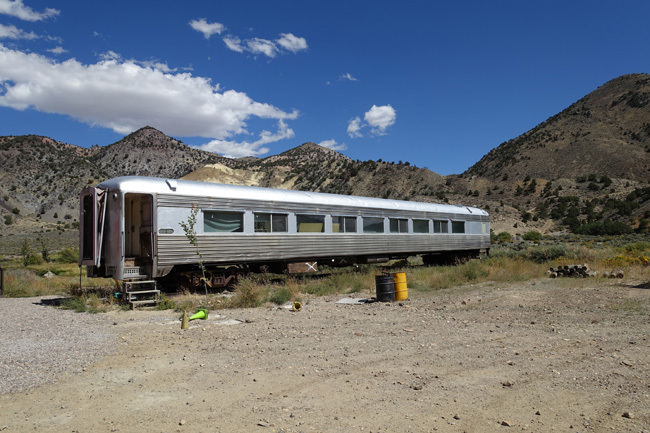 The California Zephyr is a true showpiece, with sleeping for up to 10 people and a full kitchen. I sure wouldn't mind spending a vacation there. The area is great for outdoor recreation. 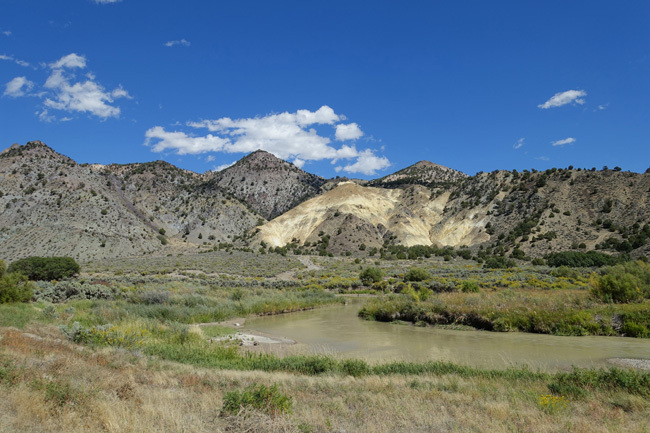 Many people come to ride the Paiute ATV trail or go tubing on the Sevier River. And Fishlake National Forest lies just to the south. 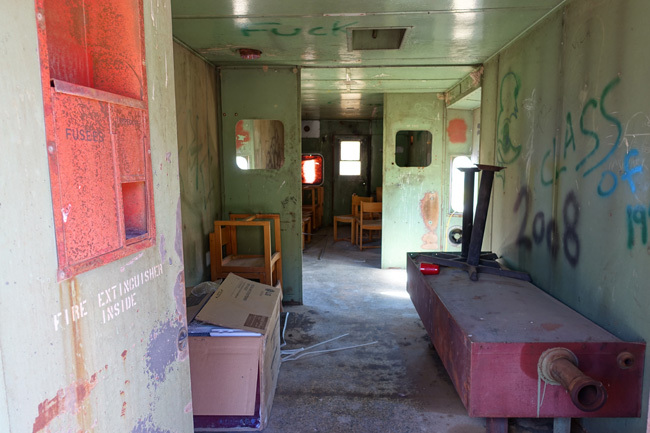 Come back next week for pictures and info about the abandoned missile launch complex in Green River, Utah. You nailed it about Utah---STUNNING scenery! Hubby and I travel through there any chance we get--which, unfortunately, hasn't been much the last 2 years. 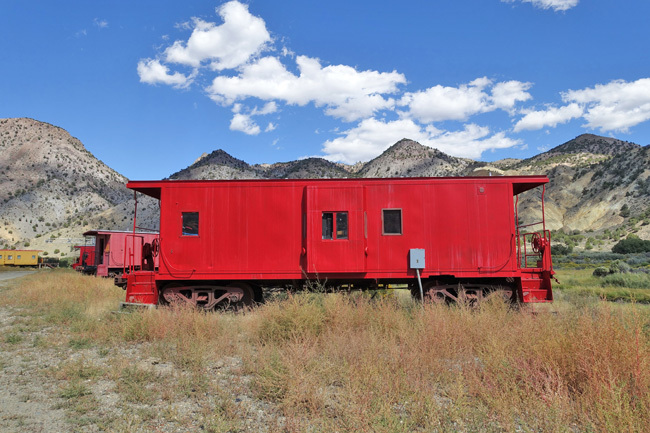 Love the colors of the train cars against that gorgeous blue sky! 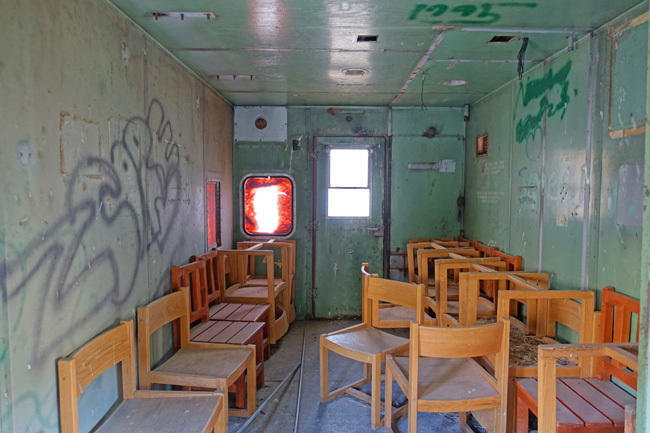 These train cars are being converted into motel units. 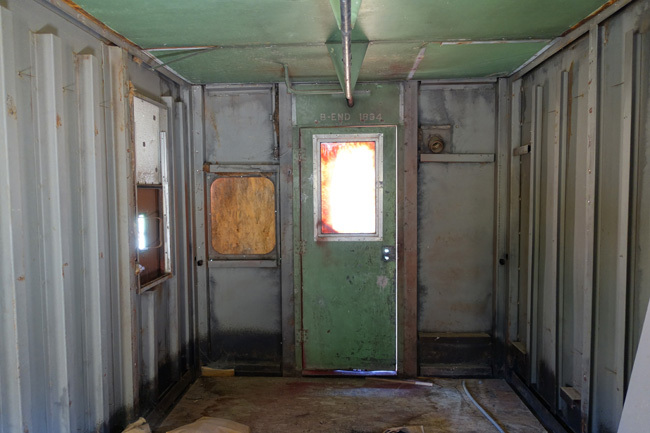 We have stayed in one of the Box Cars and they are very nice and very comfortable. I would love to stay there sometime. Such a neat idea for lodging. 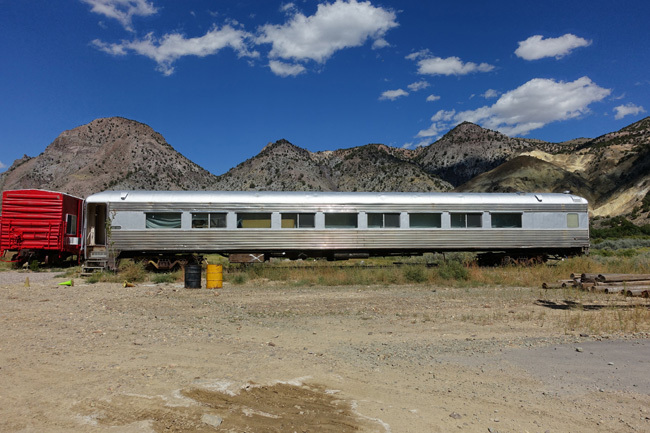 May 2018: All of the train cars have been converted and the place is officially open. We popped by and ran into the owners who gave us a tour of several of the cars. They look amazing!